Combine a tour of New Zealand's famous wine regions with some South Pacific island bliss in the Cook Islands and save £250pp with our offer. You'll be staying in boutique accommodation throughout starting with your 8 night wine tour which takes you from Auckland to Christchurch. We'll then whisk you away to The Cook Islands for the ultimate beach break. Savour the fine wines of New Zealand and feel the irresistible pull of Fiji with this unforgettable adventure, taking you to the best of these Pacific gems in just over two weeks. First, embark on an 9 night self-drive tour through New Zealand, travelling from Auckland to Christchurch, enjoying the different wines and stunning scenery along the way. Then move onto the Royal Davui Island Resort to experience barefoot luxury and a romantic island escape. 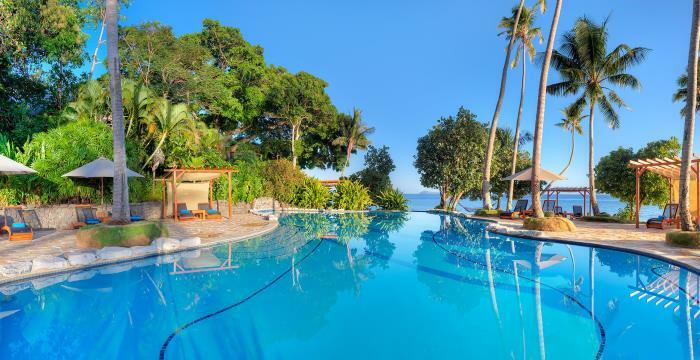 Take in the beauty of the island and its surrounds, as you engage with the wonderful Fiji waters and the verdant gardens of this picturesque location. Some of the best wines in the world come from New Zealand and on this 8 day tour of the country's North and South Islands you will get to sample them in abundance. Wine buffs will be in their element as they travel from Auckland to Christchurch sampling the nation's finest vintages and sensational scenery along the way. You will be met at Auckland airport by one of our tour representatives and transferred to your Auckland hotel . Today drive through farmland, lakeland and forest until the distinctive smell of sulphur and constant steam drifts let you know you are in tempestuous, geothermal Rotorua. On arrival, jump on board the Skyline Gondola for the ride up Mt Ngongotaha for the most spectacular views in town. Sample handcrafted wines from New Zealand’s most recognised and respected wine regions in the Volcanic Hills wine tasting room while enjoying the 180° panoramic views over Lake Rotorua. Then enjoy a buffet lunch in the Skyline Restaurant. Today you will discover the passion behind Church Road wines on a guided tour through one of New Zealand’s oldest wineries. Your 'Behind the Scenes’ tour includes the Church Road Winery, a fascinating underground museum, cellar door wine tasting and a sumptuous lunch platter. Later take a trip around town and marvel at the unique architecture. Today you will enjoy the clean, green Wairarapa scenery as you drive south for around 250 miles to Martinborough and a new wine area.The Wairarpa wine region is packed with charm. The three sub regions of Martinborough, Gladstone and Masterton include select boutique wineries, mostly family-owned and the focus is always on quality rather than volume. A short drive to New Zealand’s capital city, set between a sparkling harbour and rolling green hills. Wellington buzzes with delicatessens, cafes and restaurants – it’s a city that enjoys gourmet food and fine wine. Known as the culinary capital of New Zealand, it is famous for its tucked-away bars, quirky cafes, and award-winning restaurants. Drop off your car at the Ferry Terminal depot and board the Interislander Ferry for one of the world’s most scenic ferry journey’s across the Cook Strait to the South Island. Pick up another car in Picton and drive to Blenheim, the heart of the wine growing Marlborough region. Today’s tour includes the three icons of Marlborough - Marlborough Sauvignon Blanc, the Marlborough Sounds and Marlborough Greenshell Mussels. After a morning of wine tastings enjoy an informative and relaxing afternoon cruising the inner Pelorus and Kenepuru Sounds on a Greenshell Mussel Cruise. Take in the natural beauty of this tranquil environment, learn about the history of the Marlborough Sounds and the pioneering families who have settled here. Travel down the ruggedly beautiful coastline between the surging Pacific Ocean and the steeply rising Kaikoura Ranges, across broad rivers and the rich patchwork farming landscape of the Canterbury region to Christchurch. Today you can take a Kaikoura Whale Watching Cruise. Every Whale Watch tour is a unique experience and the sightings vary. Giant Sperm Whales are the stars of the show and year-round residents. A typical tour may also encounter New Zealand Fur Seals, pods of Dusky Dolphins and the endangered Wandering Albatross. Today your wonderful New Zealand wine tour comes to an end. Possibly time for some more sightseeing and last minute shopping in Christchurch before you drop off your car at the airport and catch your flight home. This tour can be combined with any other longer New Zealand trip and is a real must for all wine lovers.